Dance Commentary by Heather Desaulniers: "Romeo & Juliet"
"Romeo & Juliet" is familiar. Whether we know it from the text itself, from the Shakespearean stage, from a movie or television screen, from Broadway or from the ballet, we know its tragic story. Sometimes familiarity is good, yet at the same time, it can also lead to stagnation. A solid "Romeo & Juliet" is one that is fresh, challenging and exciting. For me, I can tell such a production when I am on the edge of my seat in the audience, hoping that this time, things work out for the two young lovers even though I know it won't. 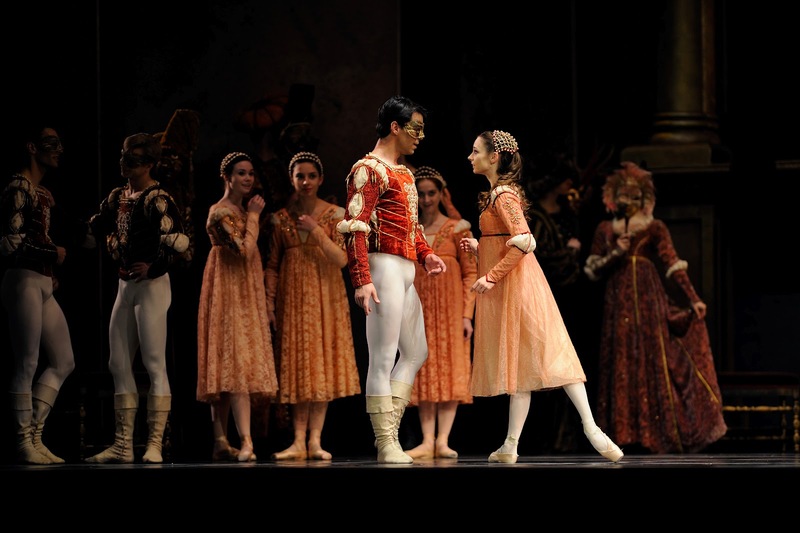 Helgi Tomasson's "Romeo & Juliet" for San Francisco Ballet is one of the greats. Neoclassical choreography combined with a passionate story is Tomasson's area of expertise. 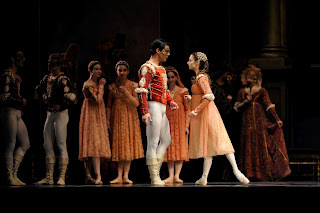 San Francisco Ballet in Tomasson's "Romeo & Juliet"
Opening night's cast was remarkable: Pauli Magierek as Lady Capulet, Anita Paciotti as the Nurse, Daniel Deivison as Tybalt, Jaime Garcia Castilla as Benvolio, Gennadi Nedgivin as Mercutio, Garen Scribner as Paris, all led of course by Maria Kochetkova's Juliet and Joan Boada's Romeo. Kochetkova is never less than perfection; she transforms as easily into a teenage girl as she does into a regal queen. Deivison's Tybalt was such a powerful presence. Often Tybalt is played very egotistically, but here, Deivison created a Tybalt whose protective nature was palpable. Even his walk forward during the ballroom scene was overwhelming in its command. Another highlight was Magierek's Lady Capulet; capturing all the dynamic levels of this mysterious woman. In Magierek's stunning portrayal, we were able to witness Lady Capulet's duality: her complete desperate unraveling when amongst death coupled with her total lack of compassion for those who are living. Neoclassical movement brought an already alive score to a new plane of existence. As Romeo, Benvolio and Mercutio wander outside The House of Capulet before the ball, they dance a charming pas de trois. Toward its end, each of them in turn executes a textbook developpé écarté, which corresponded perfectly to three accented chords from the pit. Act I, Scene VI's Balcony pas de deux was a joyful, youthful celebration of love - almost a bit giddy. Tomasson crafted and Kochetkova delivered a breathtaking ronde versé during a huge crescendo in Prokofiev's music. And, the lift where Juliet is suspended on Romeo's back floated and flew on top of an equally buoyant musical phrase. Tomasson's genius for storytelling lies in his ability to communicate the primary narrative themes in addition to uncovering some deeper and perhaps, more nuanced secondary themes, all through choreography and movement. In the case of "Romeo & Juliet", the dominant messages (love, death, tragedy, misfortune) were all abundantly clear. But as I left the theater, I found myself thinking about the forgiveness side to the story. As Juliet comes to grips with the horror of Tybalt's death (her true love who is now her husband, having killed one of her family members), forgiveness had to be part of her journey. And, I also wonder what happens to the characters after the curtain falls. When the Montagues and the Capulets discover their children dead, there will be despair and anger, but in the wake of this horrible tragedy, will they finally begin to forgive each other?